AMERICAN SPORT ART MUSUEM AND ARCHIVES The American Sport Art Museum and Archives (ASAMA) is one of the largest collection of sport art in the world. It is located on the campus of the United States Sports Academy. It claims to be the only free standing accredited sport university in the United States. Open Mon – Fri, 9am – 4pm. Free admission. The museum features 12,000 years of prehistory and history in southwest Alabama and the Gulf Coast. This museum offer a view into the ways of life of Native American Archaic and Woodland cultures, mound-building, Mississippian peoples, early French settlers and an African-American family after the Civil War. 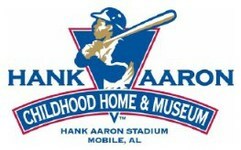 Hank Aaron’s childhood home is now part of the museum at Hank Aaron Stadium. Visit the 95,000 sq. ft. Mobile Museum of Art, the largest art museum along the Gulf Coast from New Orleans to Tampa. Enjoy the collections of American, European, Asian and African art, special exhibitions and shop at Collage, the museum’s store full of unique items.